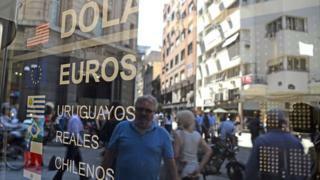 Argentina’s central bank has raised interest rates for the second time in a week as the country’s currency, the peso, continues to fall sharply. On Thursday, the bank hiked rates by three percentage points to 33.25%, following another three-point rise six days previously. However, it failed to stem the fall in the peso, which has lost a quarter of its value over the past year. Analysts say the crisis is escalating and looks set to continue. Argentina is in the middle of a pro-market economic reform programme under President Mauricio Macri, who is seeking to reverse years of protectionism and high government spending under his Peronist predecessor, Cristina Fernandez de Kirchner. Inflation, a perennial problem in Argentina, was at 25% in 2017, the highest rate in Latin America except for Venezuela. Despite the twin rate rises, the peso, which was fixed by law at parity with the US dollar before Argentina’s economic meltdown in 2001-02, is now trading at about 22 to the dollar. “This crisis looks set to continue unless the government steps in to reassure investors that it will take more aggressive steps to fix Argentina’s economic vulnerabilities,” said Edward Glossop, Latin America economist at Capital Economics. “Risks to the peso have been brewing for a while – large twin budget and current account deficits, a heavy dollar debt burden, entrenched high inflation and an overvalued currency. Mr Glossop said “a sizeable fiscal tightening” was planned for 2018, but it might now need to be larger and prompter.